My past two columns addressed fundamental principles of deep drawing flat-bottom cups and rectangular boxes. But as one might expect, many deep-drawn cups and boxes do not have flat bottoms and straight walls. What’s more, nonsymmetrical cup draws are more common. Deep-drawn cup designs may include tapered walls, hemispherical bottoms or dome-shaped bottoms. These designs have one thing in common: the need for high blankholder forces. If the blankholder forces are not high enough, loose part material between the punch-face contact and the die-entry radius will not be stretched tightly over the punch face. With loose material present, buckles, puckers and wrinkles can easily form in the unsupported region. Cups with tapered walls are sometimes referred to as cones. 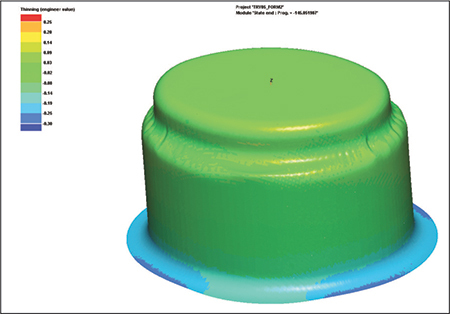 Drawing a cone shape directly from a flat blank requires substantial blankholder forces. There’s high likelihood of the part material breaking early in the punch stroke due to the small punch-face diameter and tight radius in the bottom of the cup. Successfully drawing a cone-shaped cup requires a stepped-cup approach. Step-cups have two or more body diameters within the shell. 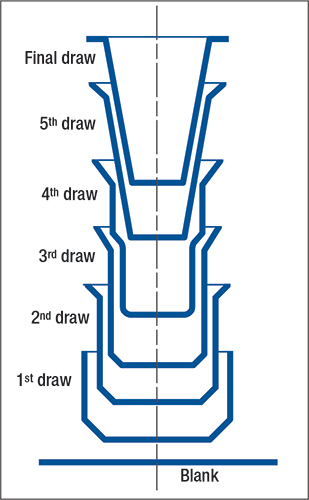 Step-shells are produced by stopping the redrawing process partially through the press stroke. Thus, only a portion of the shell is redrawn, with the stepped shell drawn into a cone in the final draw after appropriate step reductions (Fig. 1). Cups with full-hemispherical bottoms or partial domes require special attention due to process changes from simple bending around the punch radius, in the case of flat-bottom cup drawing, to stretch forming across the punch face. Thus, the drawing of dome-shaped cups requires a balanced combination of stretching and drawing. The closer the dome design comes to reaching a full hemispherical shape, the greater the importance of balancing blankholder forces and material flow. The blank must begin to draw in immediately after the stretch forming of the dome completes; otherwise, the material will continue to stretch across the punch face until it tears or fractures. When a step-shaped punch contacts the blank, the part material must initially stretch in all directions. To cause this stretching, blankholder forces must be high enough to keep the blank from drawing in too soon toward the cavity. If the blank begins to flow too quickly, the material may pucker in the unsupported step transition (Fig. 2). The term “pucker” distinguishes stretch-forming wrinkles near the punch face from conventional draw wrinkles near the die opening. Because less punch force is needed to fracture the bottom of a dome-shaped cup than a flat-bottomed cup, the percent reduction or cup height must be reduced. Not all cup drawing is symmetrical about the cup axis. Deep drawing an ellipse offers one example of a nonsymmetrical shape (Fig. 3). The difficulty encountered when drawing ellipses arises from the unbalanced flow of material toward the punch, due to disruption of the uniform compressive loads in axis-symmetric cup drawing. 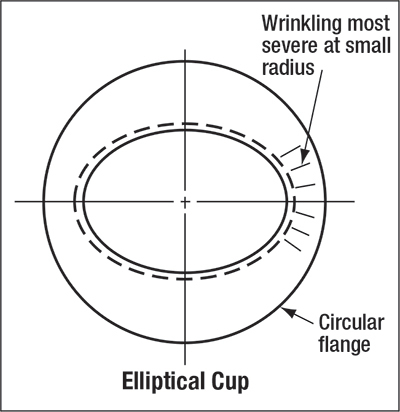 Compressive forces in elliptical cup drawing peak in the area of the smaller radius. Failures such as tearing and fracturing are more likely to occur in this area. Reduce some of these compressive loads by notching the blank in the small radius area, providing that the final product trim is not adversely affected. It also may be necessary to reduce the percent reduction or cup-wall height in order to successfully draw elliptical shapes. Another example of a nonsymmetrical cup: a flat side on an otherwise round cup. The blank material at the flat portion of the cup may flow too rapidly and leave loose material in that portion of the cup wall. The material flow in the area of the flat may need to be controlled or restricted by the use of a draw bead. Draw beads help control blank movement, when deep drawing irregular shapes. Draw beads force material to bend and unbend before entering a die cavity, creating a restraining force on the sheetmetal that causes the material to enter the die cavity under tension and at a reduced rate of speed. The height, shape and size of the draw beads determine the amount of retraining forces generated. Altering the height of the bead increases, or decreases, the amount of restraining force. A special type of draw bead known as an active draw bead can be used to lock out material near the bottom of the draw stroke to help promote stretching of the drawn part, reducing wrinkles and controling springback. These draw beads sit in a pocket during the drawing process and are raised (usually by pins under the beads) a fraction of an inch from the bottom of the press stroke to increase the restraining forces on the blank flange. The distance that active draw beads travel can be adjusted to finely tune the restraining forces required to produce an acceptable part.